There's no use fighting anymore. You're already dead. The year, 199X. The earth was engulfed in nuclear flames. The oceans have dried and the earth had split. It seemed as though all forms of life were annihilated. However, only humanity struggled to survive. The people waited for a savior who could bring light back to the desolate century's end. Fist of the North Star (北斗の拳; Hokuto no Ken, literally the "Fist of the Big Dipper") is the quintessential "man who looks and sounds like Bruce Lee, wandering the post-apocalyptic wasteland, making people explode with his fists and shedding loads of Manly Tears" manga. Essentially Mad Max meets a Bruce Lee film, Fist of the North Star became a classic of the 1980s Shonen genre for Japanese manga, written by Buronson and illustrated by Tetsuo Hara. It lasted nearly six years in Weekly Shonen Jump with 27 collected volumes, is unquestionably one of the most influential manga ever penned, and to this day, has been subjected to many parodies, seen in sources such as My Bride is a Mermaid, Excel Saga, and School Rumble (but none so much so as Bobobo-bo Bo-bobo). The story is set in a post-apocalyptic future after a nuclear war sometime during the 1990s, leveling human civilization. The world is now covered with bands of lawless thieves and mohawked ruffians who prey on the weak and innocent. Enter the muscular hero Kenshiro, who wanders from town to town searching for his fiancee Yuria (who has been kidnapped by his rival Shin) and helping those who cannot help themselves. Fortunately for Kenshiro, he is the successor to the Hokuto Shinken ("Big Dipper Divine Fist") school of martial arts, a legendary assassination art which utilizes the keiraku hiko pressure points of the human body to literally make them explode from within. Following his bout and conclusion with Shin, Fist of the North Star gradually shifts its focus to Kenshiro's battle against Raoh, the eldest of his adoptive brothers, and a would-be world conqueror who was also trained in the ways of Hokuto Shinken by their mutual master. Since the law of Hokuto Shinken only allows the style to be passed on from one master to a single pupil, it becomes Kenshiro's duty to stop Raoh from using the style to fulfill his own ambitions. The latter half of the manga, set several years after Raoh's defeat, has Kenshiro rejoining his former sidekicks Bat and Lin, now grown up and leader of the "Hokuto Army", as they fight off the corrupt Army of the Celestial Emperor (Tentei). While Kenshiro and his friends are successful in defeating their foes, Lin is kidnapped not long afterwards and taken to the Land of Shura, catapulting the successor of Hokuto Shinken into another war with the three warlords of Shura, all masters of Hokuto Ryuken ("Big Dipper Gemstone Fist"), a martial art which branched off from the same clan that developed Hokuto Shinken. While the Animated Adaptation ends with Kenshiro's final fight against Kaioh, the manga continues with a few additional story arcs involving Kenshiro's adventures into new frontiers with a young boy named Ryu (Raoh's orphaned son from an unknown woman), as well as a true resolution to the Love Triangle between Kenshiro, Lin, and Bat. Body counts are often in the dozens per chapter and any major fight is usually followed immediately by Kenshiro shedding Manly Tears and/or Tender Tears for the fallen, having discovered his opponent was noble all along or just misguided, even if he had been, for example, kidnapping children and laboring them to death in order to build a giant pyramid. Despite the manga's popularity in Japan, it was only partially translated in English twice before both attempts were canceled (first by Viz Media during the 1980s and 1990s in a series of monthly comics, and later by Coamix's short-lived American subsidiary of Gutsoon Entertainment in the early 2000s as a series of colorized graphic novels). Fist of the North Star - A weekly Animated Adaptation by Toei Animation that aired from 1984 to 1988. The series follows the manga's storyline closely for the most parts, with plenty of filler material added to prevent it from overtaking the original source. In Japan, the anime actually aired under two titles: the original Hokuto no Ken (109 episodes, covering the first half of the manga all the way to the final conflict with Raoh) and Hokuto no Ken 2 (43 episodes covering the Celestial Emperor and Land of Shura arcs). The first 36 episodes were dubbed during the late 1990s by Manga Entertainment and shown on Showtime Beyond and Sci-Fi Channel UK. The remainder was released subbed-only via digital distribution and is currently available on DVD and Blu-ray note In Standard Definition, with all 152 episodes across 3 Blu-ray discs by Discotek Media. Fist of the North Star: The Movie - A 1986 animated film by Toei that loosely follows the manga's storyline from Kenshiro's origin story on how he got his seven scars to his first battle with Raoh. Many English-speaking anime fans were first exposed to the franchise in the form of its English dub by Streamline Pictures released during the early 1990s. It too is available on DVD and Blu-ray from Discotek. New Fist of the North Star (Shin Hokuto no Ken) - A three-part OVA series released between 2003 and 2004 set years after the end of the original manga. The story is actually an adaptation of a Hokuto no Ken novel which Buronson and Hara published in 1995. The series was released by ADV Films during the mid 2000s. The Legends of the True Savior (Shin Kyuseishu Densetsu) - A five-part movie/OVA series produced between 2006 and 2008 that serves as remakes/side-stories of the original manga. Legend of Raoh: Chapter of Love in Death (Jun'ai no Shō; 2006 movie) - Focuses on the Holy Emperor (Seitei) arc regarding the conflict between Kenshiro and Souther, but primarily seen through Raoh's perspective. This film also introduced Canon Foreigners Reina and her brother Souga, who would reappear in future Fist of the North Star material. Legend of Yuria (2007 OVA) - Seen from Yuria's point-of-view, this OVA details her origins and first encounter with Kenshiro to her ascendency to become the Last General of Nanto. Legend of Raoh: Chapter of Fierce Fighting (Gekitō no Shō; 2007 movie) - A follow-up to Chapter of Love in Death, this movie covers the Last General of Nanto arc, leading to the final bout between Kenshiro and Raoh. Like the preceding film, much of the narrative is focused on Raoh. Legend of Toki (2008 OVA) - Centered around Toki, another of Kenshiro's adoptive brothers trained in Hokuto Shinken, the OVA covers his origins, imprisonment at Cassandra and his duel with Raoh. This OVA introduces another Canon Foreigner Sara, a medical doctor who diagnosed Toki of his failing health from radiation poisoning and assists him in his quest to use Hokuto Shinken as a healing technique rather than an assassination art. Legend of Kenshiro (2008 movie) - Effectively a Prequel to the manga, this film tells of the events following Yuria's kidnapping by Shin to Kenshiro's first meeting with Bat and Lin. DD Fist of the North Star - A complete shift in tone, characters are portrayed as not-all-there Super-Deformed younger men in modern day Japan fighting not for the wasteland, but for a part-time position in a grocery store (and Yuria's heart). It features Kenshiro, Toki, Raoh and countless other post-apocalyptic thugs transplanted into a sitcom. Fist of the Blue Sky (Souten no Ken) - A 22-volume manga prequel series starring Kenshiro's uncle and namesake, Kenshiro Kasumi. Set during the mid-1900s before the nuclear war in Shanghai, it was adapted into a short-lived anime in 2006 and a 12 episode 3D series in 2018 (with the subtitle Regenesis). Legends of the Dark King (Ten no Haoh) - A 5-volume manga spinoff starring Raoh that was adapted into an anime in 2008, Legends of the Dark King expands on Raoh following the post-apocalypse and his rise to power as the "King of Fists" (Ken-oh), with assistance from his childhood friends Reina and Souga. Soukoku no Garou ("Bloody Wolf's Darkness Blue") - A 6-volume manga spinoff released in 2006 starring Rei, Soukoku no Garou details his origins and his quest to find his missing sister Airi before his first meeting with Kenshiro. Shirogane no Seija ("Silvery Savior") - Released in 2007 in 6-volumes, this manga spinoff features Toki and his attendant Ramo, and their founding of the "Village of Miracles" where Toki heals the sick and wounded with his knowledge of Hokuto Shinken, before his introduction in the manga. Jibo no Hoshi ("The Merciful Mother Star") - A one-volume manga spinoff released in 2006, it features Yuria and the events surrounding her before the nuclear war. Flower of Carnage (Gokuaku no Hana) - Another manga released in 2008, this 2-volume spinoff stars Jagi, another disciple of Hokuto Shinken and adoptive brother to Kenshiro, Toki and Raoh, under the tutelage of their master Ryuken. Houkou no Kumo ("Way of the Clouds") - A 2010 manga spinoff released in 2-volumes starring Jyuza, following his adventures during the post-apocalypse. Ryuken Gaiden: The Judgement Day ("Ryukens Story: The Judgement Day) - A one-shot prequel chapter, it is centered around Ryuken and how he chose the Hokuto Shinken successor and the events related to it. Hokuto no Ken: Ichigo Aji (Fist of the North Star: Strawberry Flavor) - A comedy spin-off starring Thouzer which debuted in 2013. It features the serious and detailed art inspired by Tetsuo Hara recreated by Yukito Imouto, set in absurdly funny situations where the originally cruel and devoid of compasion Thouzer is presented as a guy who just wants to make friends with Kenshiro and have fun with his Nanto Seiken companions. 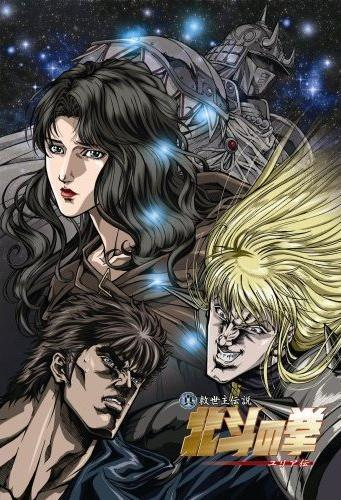 An anime adaptation was produced as end segments of the second season of DD Hokuto no Ken. Fist of the North Star: Twin Blue Stars of Judgment - a 2D fighting game developed by Arc System Works released in arcades and on PS2 in 2005. The arcade version received a limited release overseas, but the PS2 port was never released outside of Japan. Fist of the North Star: Ken's Rage (Hokuto Musou) - A 3D brawler developed by Koei Tecmo and released on PS3 and Xbox 360 in 2010. The game adapts the events of the original manga up through the final battle with Raoh, and includes a "Dream Mode" that portray a variety of alternate events in the series' story. A sequel was released in 2012 on PS3, Xbox 360, and Wii U which covered the entire manga's story from beginning to end. Fist of the North Star: Lost Paradise (Hokuto ga Gotoku) - A 3D action-RPG published by Sega, released on PS4 in 2018. Done in the style of Sega's Yakuza series, this game follows an Alternate Continuity which sees Kenshiro's journey to find Yuria lead him to the post-apocalyptic city of Eden. Fist of the North Star - An American film adaptation released in 1995 that loosely adapts the events of the Southern Cross story arc.